At that time India was a part of the British Empire, and Blair's father, Richard, held a post as an agent in the Opium Department of the Indian Civil Service. The Blair family was not very wealthy - Orwell later described them ironically as "lower-upper-middle class". They owned no property, had no extensive investments; they were like many middle-class English families of the time, totally dependent on the British Empire for their livelihood and prospects. 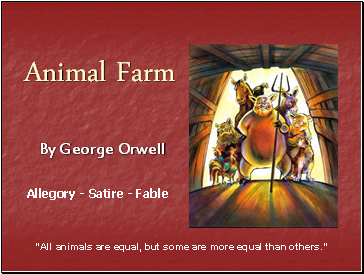 The novel, published in 1949, takes place in 1984 and presents an imaginary future where a totalitarian state controls every aspect of life, even people's thoughts. 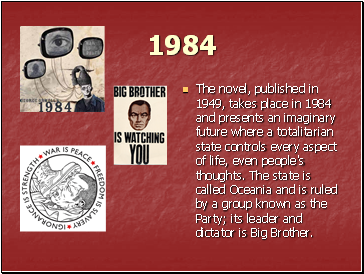 The state is called Oceania and is ruled by a group known as the Party; its leader and dictator is Big Brother. 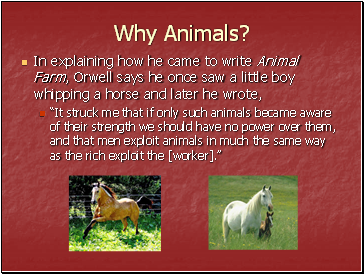 Orwell was a person who had a reputation for standing apart and even making a virtue of his detachment. This “outsider” position often led him to oppose the crowd. 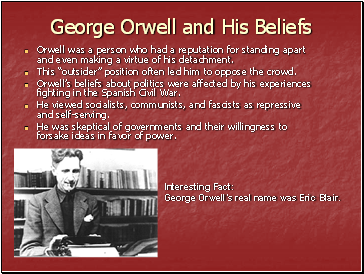 Orwell’s beliefs about politics were affected by his experiences fighting in the Spanish Civil War. He viewed socialists, communists, and fascists as repressive and self-serving. He was skeptical of governments and their willingness to forsake ideas in favor of power. 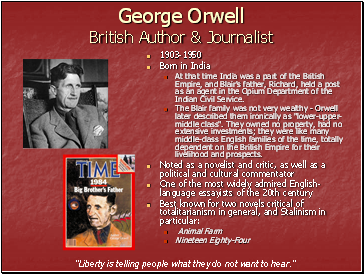 George Orwell’s real name was Eric Blair. 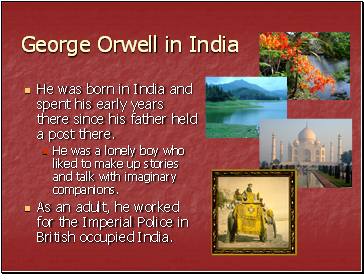 He was born in India and spent his early years there since his father held a post there. He was a lonely boy who liked to make up stories and talk with imaginary companions.